While the story for many elephants orphaned by poaching might not always have a happy ending, Quanza's story is different. Baby elephant Quanza was a one year old milk dependent calf when she saw her mother shot dead with an assault rifle before her tusks were hacked off by poachers. Quanza's two sisters faced the same fate and the young calf was spared only because she had no ivory and so wasn't worth wasting a bullet on. Reliant on her mother's milk, she would not have survived without intervention. 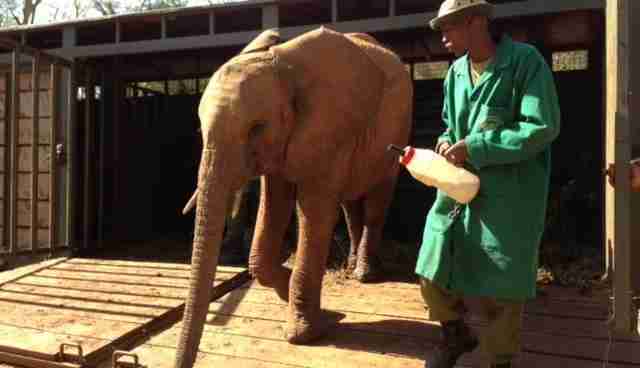 Luckily for this elephant calf, she was rescued by the David Sheldrick Wildlife Trust and taken to Kenya's only elephant orphanage to be cared for. After months of specialist care to overcome the emotional trauma she experienced and forming bonds with a human-elephant family that allowed her to stabilize and become part of the orphan elephant herd, last week Quanza began the next phase in her journey back to a life in the wild; moving to a brand new specialist reintegration center in a protected area where she will learn how to become a wild elephant once again. Her first months at the Stockade will present her with many challenges: she will need to learn new survival skills - sleeping alone and finding edible plants, and over time will become less dependent on her human Keepers who will remain with the young orphans until they join wild herds. 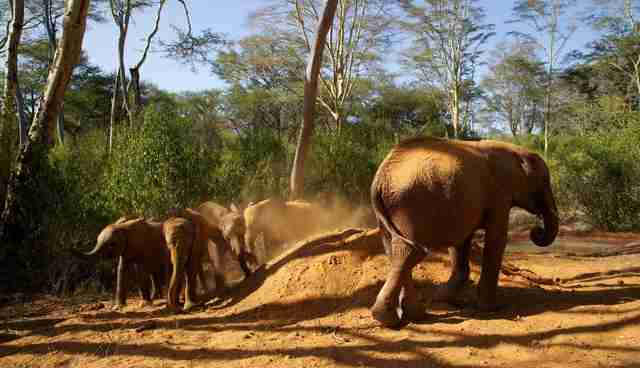 Already, camera traps have found wild elephants visiting the new arrivals from the nearby Chyulu Hills National Park coming to drink from the new drinking trough erected for the orphans' use. 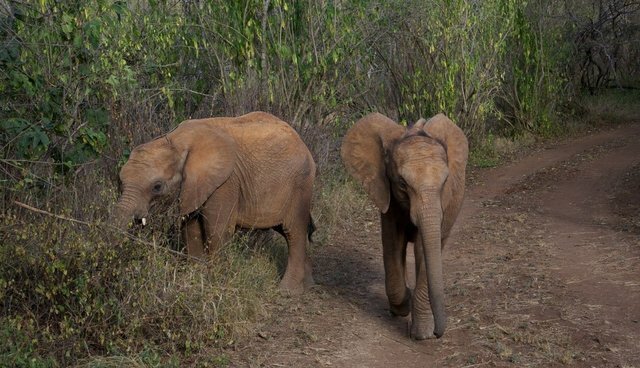 A 4am start on June 27th saw Quanza, and two other orphaned elephants, begin their journey. A few hours later, they arrived at the Umani Reintegration Stockade, close to the Chuyulu Hills National Park in Southern Kenya. Greeting orphan friends who'd travelled days before them, Quanza joins a fledging herd of poaching victims that will one day return to a life in the wild. More info on the move here. The sole survivor of a poaching attack that shocked conservationists, Quanza was witness to a horrific incident that killed one of Amboseli National Park's famous Matriarchs and two daughters. Found standing next to her mother's mutilated body, Quanza was the family's only survivor. Just 24 hours before the attack, the family had been pictured together in a beautiful family portrait by photographer and founder of Big Life, Nick Brandt. Copyright Nick Brandt So much would change in only a day. Three gun shots destroyed little Quanza's life and immediate family. 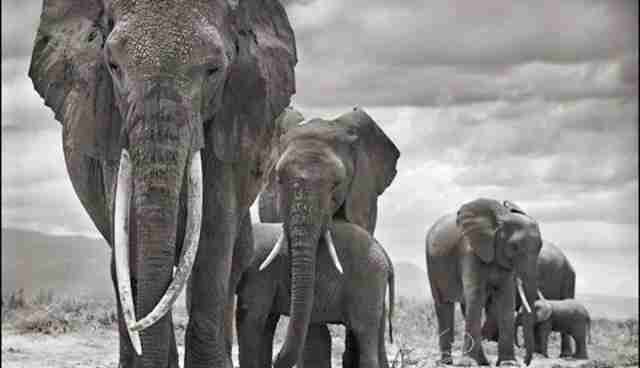 The famous matriarch of the Q Herd of Amboseli National Park killed instantly along with her two daughters by poachers in October 2012. Their faces hacked off by the poachers to be sure they gleaned every ounce of ivory. Now aged 2 years old, the move to Umani Springs Reintegration Centre represents an important next stage in Quanza's journey back to the wild. Life for elephants has been made exponentially difficult by ivory poachers. Poisoned arrows, AK47's and snares all threaten not just stealing an elephant's tusks and its life, but also the lives of their infant calves. 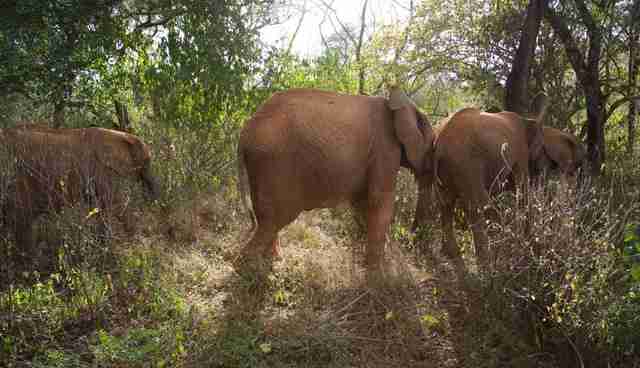 For Quanza and the centre's new arrivals who have suffered so much, their journey back to the wild has properly begun. 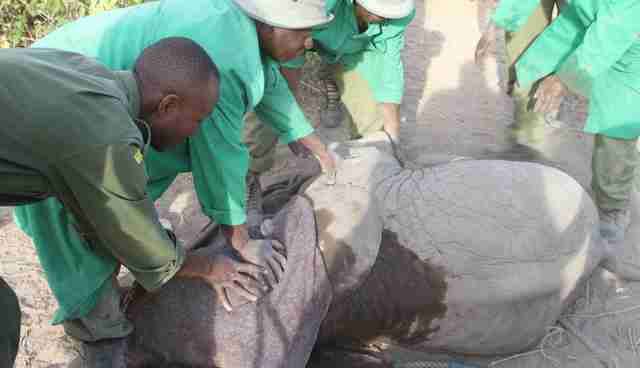 Find out how you can support the reintegration and rehabilitation of Quanza at www.sheldrickwildlifetrust.org.